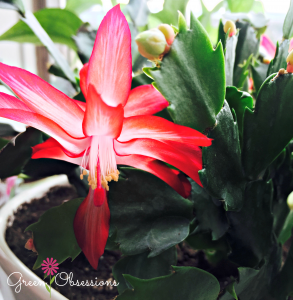 This red flowering thanksgiving cactus has a lot to be thankful for. Last year I rescued it from the death row clearance isle where the next stop would most likely have been the trash. It was limp and looked liked it hadn’t been watered in weeks. I wondered if I could revive it back to health, and I did. And now, appropriately, it is as though it is showing its appreciation as it flowers away. I purchased what I thought was a white-flowering thanksgiving cactus as well a couple of weeks ago because I thought the red and white would look better together in one pot. Was i surprised when the flower turned out to have a tint of pink. Beautiful isn’t it? 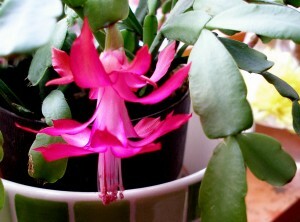 Schlumbergera is a genus of cacti with only 6 species originating from the coastal mountains of south-eastern Brazil. 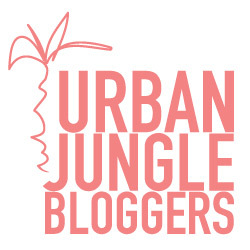 In the wild, they grow on rocks(epilithic) and trees (epiphytic) in shady and high humidity environments. 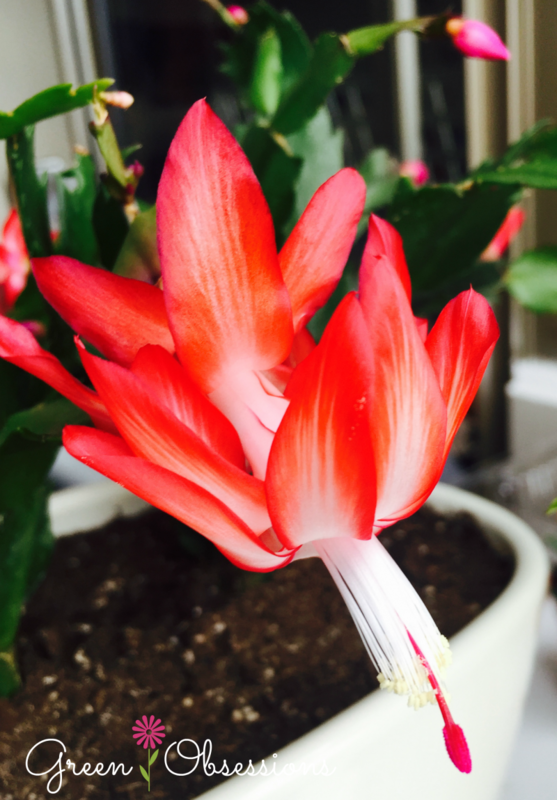 In Brazil, the Schlumbergera genus is known as ‘Flor de Maio’ meaning May flower, as this is when they flower in that region1. 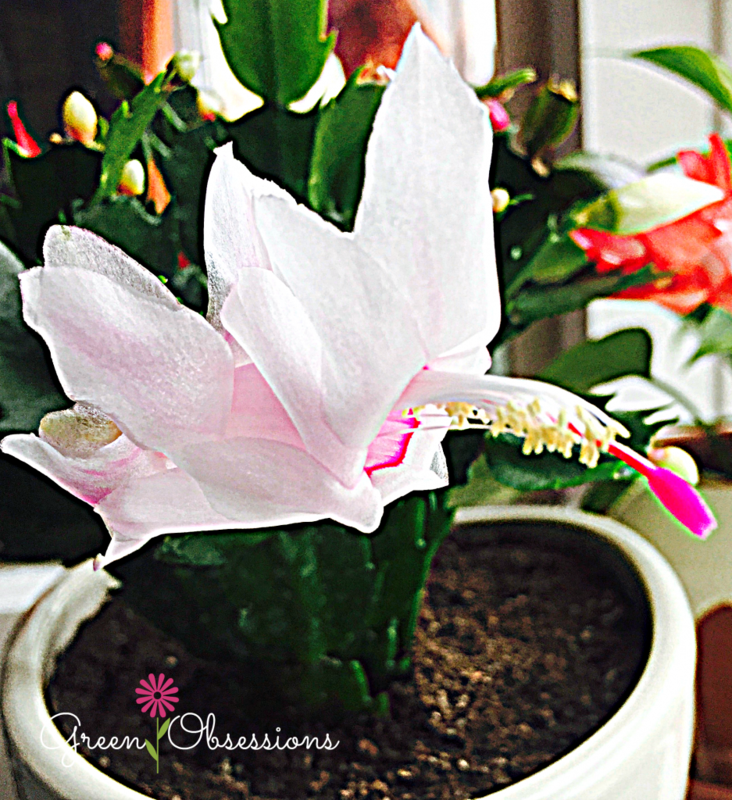 Schlumbegera truncata also known as claw, crab or thanksgiving cactus is usually confused with Schlumbegera buckleyi, the christmas cactus. There are differences between them which care noticeable if you pay close attention. Light: They require medium light and should avoid full summer sun. Mine is growing in a north window and seems quite happy. Apparently too much light causes the stems to take on a reddish colouration. Very low light levels however will prevent flowering. Short day length promotes flowering; continuous darkness for at least 12 hours is necessary to induce bud formation. A period of about 8 days with 16 hours of darkness at 16 °C has been shown to cause flower buds to form1. 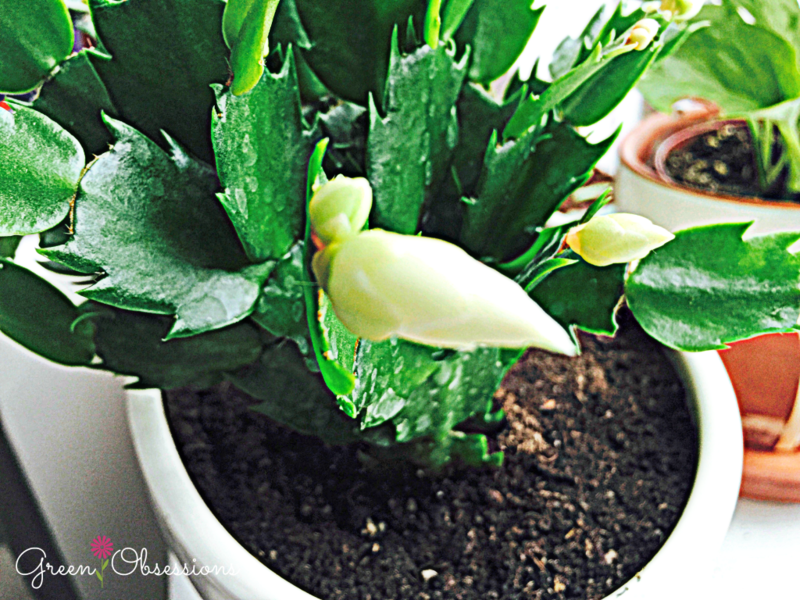 Once these cacti have begun to bud, try to keep them away from artificial light through the evening as the lack of day light is what promotes flowering. Buds are prone to bud drop if a conducive environment isn’t met. I made the mistake of repotting and moving my thanksgiving cactus and placing it near a heater while it was budding. A few buds dropped because of this. I was afraid I would lose all the buds but I moved it to a cooler location away from the vent and was able to save some of the buds which are now flowering. Apparently bud drop can happen when light exposure is changed. The buds turn and twist towards the light and if this is severe they may literally twist themselves off. Watering: They require moist but not soaking wet soil from March through August to encourage growth. When flowering ceases water only moderately—enough to moisten the soil. Unlike desert cacti, jungle cacti like high humidity and will benefit from daily misting especially y in spring and summer. Rainwater is always preferable due to its low calcium content. Since I do not collect rainwater, I use spring water or tap water that has sat out for at least 24 hours. Soil: Fast draining mixture. I’m no expert in making my own fast draining soil mixture so I just buy cacti mix soil from garden stores and that seems to work. Temperature: Normal indoor temperatures are suitable throughout the year. They can be outdoors in a shady spot during spring through summer but should be moved indoors before the start of cold weather. Propagation: Schlumbergeras appear to be quite easy to propagate. They can be propagated from cuttings (like succulents) at any time of the year except when the parent plant is in bloom. I suspect though that you may have more luck when propagating during spring or summer. Simply twist off a section of stem consisting of two or three joined segments, allow it to dry for a few days and then push the bottom segment gently into a fast draining soil. Insert the segment just deep enough to support the whole cutting. Treat the cuttings as mature plants and they should start to grow within four weeks. They can be propagated by seeds as well but this is a bit beyond me at the moment. 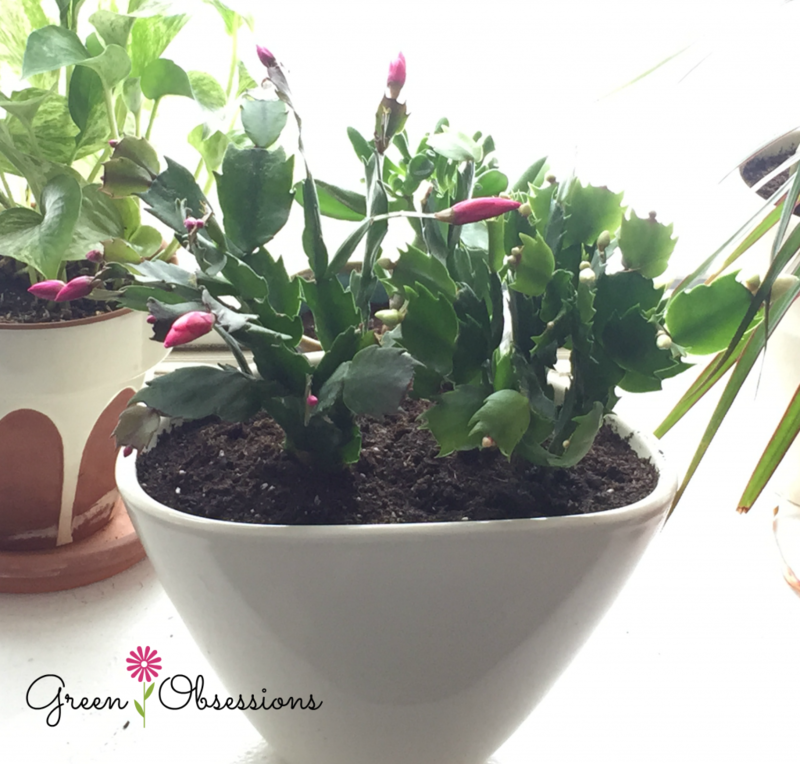 Schlumbergera truncata is an easy plant to take care of and well suited for a newbie green thumb as my self. Although it is more beautiful with its flowers, the shape of its leaves can be a great conversation piece and therefore worth keeping even after flowering ceases.